When Genii burst upon the magic scene in September of 1936, Bill Larsen, Sr. had put his heart, soul and pocketbook at stake in much the same way that David did when he faced the mighty Goliath. But in this case, “Goliath” was John Mulholland’s Sphinx; long-established independent journal of the art, brought to its zenith in the 1920s by Kansas City physician, Dr. Albert M. Wilson. Larsen, together with his close friend, T. Page Wright, were frequent contributors to the Sphinx when it was under Wilson’s hand. But after Wilson’s death in February, 1930, Larsen watched as the journal, in his opinion, deteriorated under Mulholland’s leadership, from the factual presentation and reporting of the magician’s art, into a glossy “Harper’s Bazaarish” (to use Larsen’s own words) magazine. Certainly, in New York City, the scholarly Mulholland felt in the fall of 1936 that the small upstart way out on the West Coast would never have the impact of the venerable Sphinx. But by 1937, when Genii subscriptions increased and more kept coming in, John Mulholland must have realized that the Genii would never again be restrained in its bottle. Magic, in the 1930s had seen little change from the days of Robert-Houdin. Certainly, there were the large elaborate shows of Blackstone and Dante, and the standout smaller acts such as Cardini, Jack Gwynne, and Ade Duval. But these were the exceptions rather than the rule. In general, the amateurs and semi-pros were content in presenting the same magic that had entertained audiences in their grandfather’s day. But Bill Larsen, in his thought-provoking editorials, always challenged the complacent magicians to modernize their ways of thinking and bags of tricks to suit the new demands of the entertainment buying public. Readers responded to Larsen’s editorials and his magazine, with its qualified contributors and practical tricks; and by 1940, the subscriptions had blossomed to several thousand throughout the world. The first half of the decade of the forties found the world involved in war. And Genii was there every month; to bring reassuring news of home to magicians in the trenches, and words stateside from those on the front lines, whose common link was the art of magic. In 1942, the Larsen’s purchased Floyd Thayer’s Magic Company. Again, Bill’s desire to improve the art pervaded every part of the business. He eliminated many effects from stock that he felt were antiquated in favor of ones more suited to a contemporary audience. But, rather than turn Genii into a “house organ,” the magazine remained entirely independent. Bill limited the amount of advertising space given to Thayer’s and kept the interest of his readers foremost in his mind. 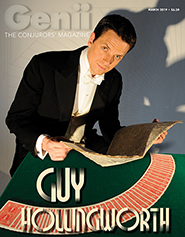 With the magic shop, shows, lectures, and later involvement with the legal profession, Larsen was finding little time for Genii; but with Gerrie Larsen as Business Manager and Bill as Editor of Magic, during the decade the magazine prospered. In 1941, the S.A.M. had shown their confidence by awarding Genii with the contract to print their M-U-M. as part of the magazine; thus taking away some of the Sphinx readership. Then, with the end of the war in 1945, many soldiers who had taken Genii with them into the battlefield were back home again as regular readers. 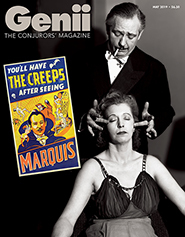 And later, in November, 1949, Genii absorbed The Conjuror’s Magazine. All of these things found, by the end of the decade, a boost in the popularity of the magazine, and because of it, the art of magic. The Larsens sold Thayer’s in 1950. When the Sphinx passed its Golden Anniversary mark in March of 1951, Bill’s opinions of the magazine had not changed from 21 years before; although possibly in the intervening years, they had mellowed a bit. Then, on July 5, 1953, Bill Larsen Sr. died suddenly at the age of 48. Many predicted it would be the end of Genii. But Gerrie, Bill Jr., and Milt said “No”! In stepped Bill, Jr. to take the reins. When John Mulholland’s health and other pursuits caused him to discontinue the Sphinx in the Fall of 1953, Genii was firmly in control of the magic scene; although magic was having a hard time holding its own. General interest in magic had begun to decline. With the 1950s postwar “baby boom,” many fathers had traded their magic wands for diaper pins. But subscriptions held steady, and Bill Jr. kept his father’s policies in effect: honest journalism, fair reporting, excellent tricks and articles. They all helped keep Genii going through the lean years. The full impact of the medium of television was being felt in the early 1960s. Bill and Milt both became involved in the industry. And out of that “box in the living room” came a new magic superstar: Mark Wilson, who with his Magic Land Of Allakazam shot a dose of life into the art that some said was dying. And all the while, Genii was still there. Then, in 1962 a dream come true—The Academy of Magical Arts and The Magic Castle! Originally an idea of Bill Sr.’s, the Academy had first been formed in 1952 (at that time all Genii subscribers were automatically members), but the project stood dormant after his death. It took Bill, Jr. and Milt to bring their father’s dream to full fruition. And again, Genii did not become just a “mouthpiece” for the Academy and the Castle, but fairly gave time to all magicians and organizations with the betterment of magic in mind. As Mark Wilson had done the decade before, in the 1970s Doug Henning brought a renaissance to the art with his performance in The Magic Show, and many network television appearances. And still, Genii was there, keeping pace with the times informing magicians of the current news and happenings. And, Bill and his bride Irene didn’t just wait for news to come to them; they searched it out. Wherever magicians gathered at major conventions or events around the world, Bill and Irene were there, too, with note pad and tape recorder in hand making sure Genii readers were informed readers. The rebirth of the large touring illusion show of the past, modernized by the likes of Henning, Copperfield, Blackstone Jr., Reveen, and Kramien, kept magic in the minds of the theater-going public. Siegfried and Roy continued to thrill capacity crowds in Las Vegas. Magic clubs and conventions find enthusiastic attendees. And still, Genii was there. 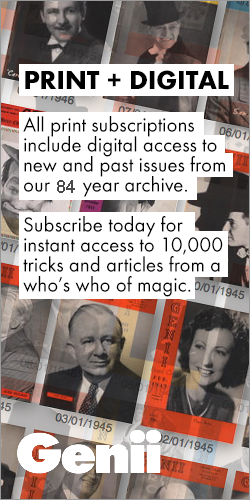 That any magazine survives, and more importantly, prospers for more than a half century, especially in such a closely-knit fraternity as the art of magic, is testimony to one thing: dedication. In this case, it is the dedication of the entire Larsen family to the art that allowed Genii to continue and grow. Scores of magazines have come and gone during the last fifty years. As Bill Larsen, Jr. became ill due to alcoholism, the editorship of Genii was taken over first by Dante Larsen (the son of Irene and John Daniel), and later by Erika Larsen. The magazine faltered and it appeared that it would end in 1998 when it appeared only three times. 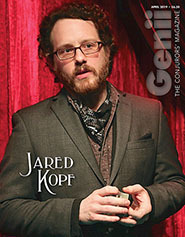 In October 1998, the Larsen family sold Genii, The Conjurors’ Magazine, to a new company headed by famed author, illustrator, and publisher, Richard Kaufman. Since the first issue published by The Genii Corporation appeared in January, 1999, Genii has been on time every single month and grown to over 100 pages an issue with much of it in color. 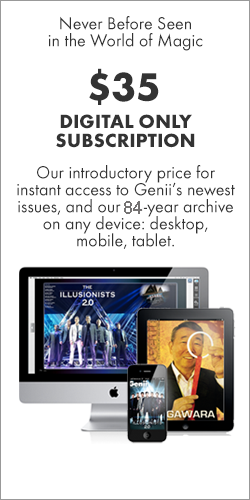 With a fresh start, Genii has once again become the premier magazine in the field of magic and has a long future ahead of it in the 21st century. The entire history of magic for the last three-quarters of a century is contained in the pages of Genii.